Instruction ManualPlease read and understand the following instruction correctly and accurately before applying GLÄSERN™. Disregard of any instructions listed below could result in substandard performance of the product. Use the provided microfiber cloth to wipe away any dust particles and smudges on the tablet screen. Shake the glass vial containing GLÄSERN™ gently. Remove the lid and slowly fill the provided dropping pipette with GLÄSERN™. 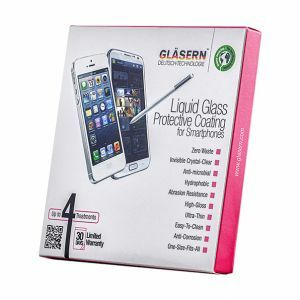 Gradually drip two (2) drops of GLÄSERN™ onto the smartphone screen and spread the droplets across the screen surface in alternate lengthwise and crosswise direction with the microfiber cloth until it is evenly distributed. Avoid touching the coated screen surface within two (2) minutes and subsequently wipe off any residue with a clean tissue paper. Repeat steps 2 to 4, for three (3) times and the entire process of GLÄSERN™ treatment is consider done. Enjoy the best multi-function Nano liquid glass coating after 48 hour and for best performance, please reapply GLÄSERN™ once every 3 months, or as needed.